Well mosaic as a medium is certainly extremely tough, but then so are the conditions they are exposed to in our modern built environment. If you are lucky enough to own a mosaic here are a few tips for looking after your artwork and keeping it looking it’s best. 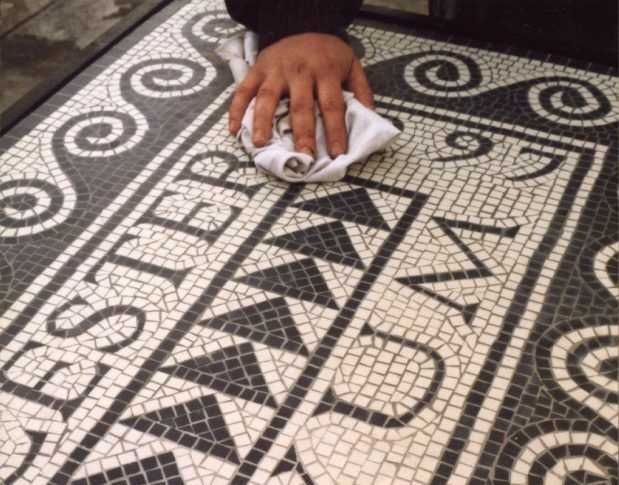 Caring for your mosaic needn’t be arduous but will keep your mosaic looking great. 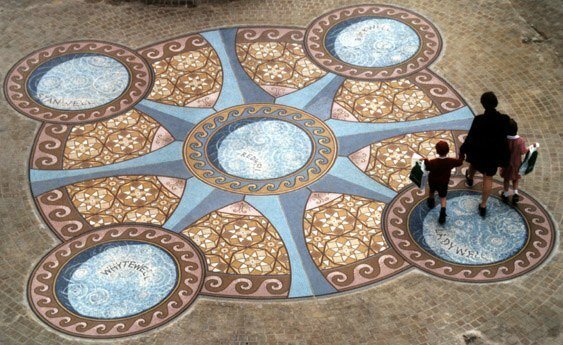 Mosaics require little maintenance and are easily kept clean by regular sweeping, and occasional washing. Simple wiping with a clean damp cloth with warm water is the best regular cleaning and for heavier soiling washing down should be carried out with warm water to which a soapless detergent has been added and finally rinsing with clean water and drying. Unglazed ceramic finishes will not be damaged by the occasional use of scouring powder, pumice blocks to remove particularly stubborn blemishes. A well fixed mosaic should be treated in much the same way you would clean your floor or wall tiles. If your mosaic is made from marble tesserae then you should ensure that no acidic or abrasive cleaners are used. The interstices (gaps between the tesserae usually filled with grout) can become dirt traps so these do need to be cleaned. Regular cleaning can be carried out with a proprietary grout and tile cleaner as the breakdown of the interstices will lead to potential failure of the tesserae. NOTE: Care is necessary to ensure that cleaning agents are not allowed to come into contact with adjacent fixtures and wall surfaces. NOTE: It should also be noted that the regular use of scrub and rinse cleansing machines fitted with abrasive pads, other than the finest grades, is likely to damage the surface and may result in gradual loss of thickness in the wear layer. Caring for your mosaic will ensure its long life. From time to time it may be beneficial to re-grout the mosaic to ensure that it stays in prime condition. Occasional inspection, once a year, to check on the condition of the mosaic, and in particular the grouting, is recommended. 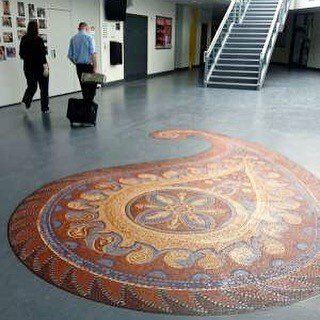 To keep the mosaic in top condition, particularly in heavily trafficked areas we would recommend a 10 year service – a thorough deep clean and regrout. If all else fails – Call for help. Further deep cleaning on ceramic and glass mosaics can be carried out with dilute hydrochloric acid (spirits of salts). However excessive use of acid could result in the serious degrading of grout areas and damage to stone surfaces. Hydrochloric Acid is of course also governed by strict health and safety law so this level of cleaning is best carried out by professional restorers. (f) frequent use of unsuitable cleaning agents, including highly alkaline detergents and chemicals. Efflorescence is a white powdery like substance that can sometimes appear on the surface of a mosaic. It is caused by salts seeping through from the background and is aggravated by excessively damp conditions following installation or prolonged delay in drying out and may be persistent if it is due to rising moisture where damp-resisting construction is inadequate. The deposit should disappear with washing but may reappear after drying; it should diminish with progressive washing and the most effective treatment is to increase the frequency of washing until the deposit ceases. Persistent deposits may be treated with appropriate proprietary acidic cleaners, but in such cases the floor should be wetted and the free water removed before the application of the cleaning agent. It is important that this treatment is followed immediately by thorough rinsing with clean water. The application of linseed oil, permanent sealing compositions or polishes is not recommended since these materials are not absorbed into the surface and tend to make the surface slippery and difficult to clean. Effective cleaning can usually be achieved by normal washing or scrubbing with warm water and a neutral sulphate-free detergent. Greasy deposits can be removed by detergent incorporating an organic solvent or a highly alkaline detergent (pH >9), but these should be used for only occasional cleaning. It is essential that a detergent used on a regular basis is of a type recommended for cleaning ceramic floors. The occasional use of abrasive cleaners can be beneficial but should be restricted to unglazed floor finishes. It is important to ensure that the cleaning agent is completely removed by final rinsing with clean water. Household soaps are not recommended as they tend to leave a slippery scum, particularly in hard water areas. More serious damage (impact damage, missing tesserae or cracks appearing) should be repaired immediately as damaged areas can easily grow. If you have a mosaic made by us that needs attention Gary should be contacted on 0771 9529520 or gary@drostle.com should any such repair be required. 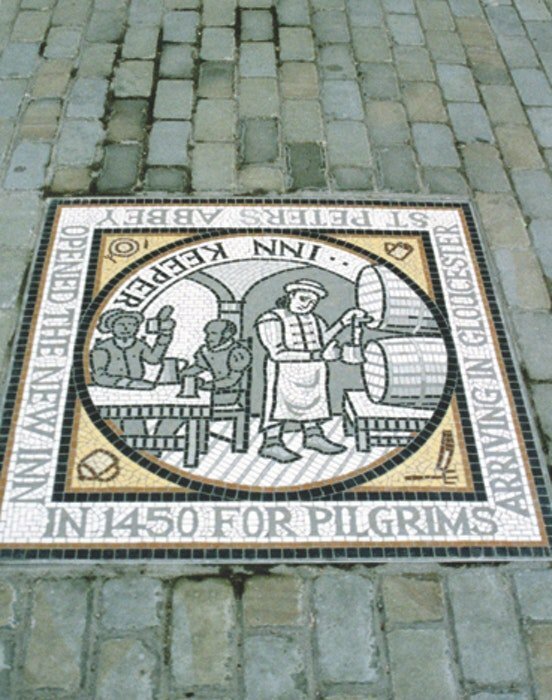 Gary has been creating public artworks and mosaics for over thirty years and retains a keen interest in all his work and is always happy to answer any questions on your commission. You can see some of his award winning mosaics here. Or write to – DROSTLE PUBLIC ARTS, F2 Old Europa Gym Centre, Europa Trading Estate, Fraser Road, Erith, DA8 1QL, United Kingdom.